Why you should offer branded leather wallets in gift set? If you are looking for a great promotional product then you should consider offering branded leather wallet as a marketing gift. Premium quality. All leather items in general look very high end. 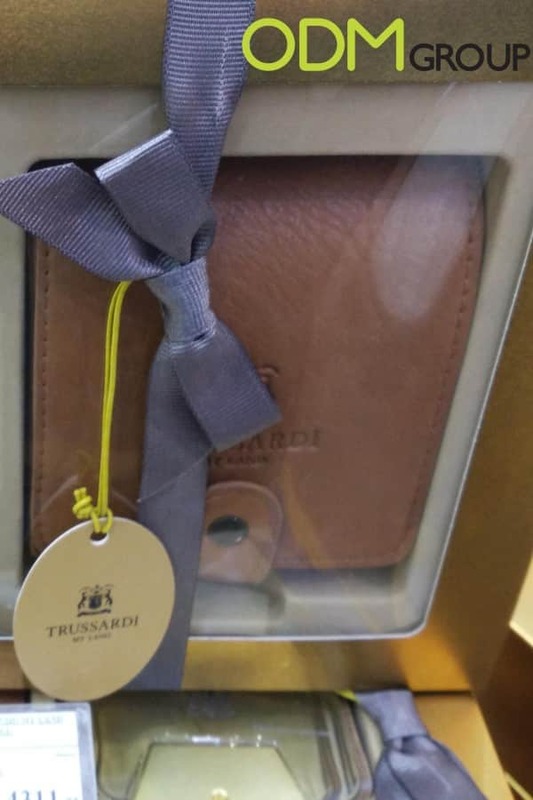 Trussardi’s promotional wallet is made of good quality brown leather with debossed logo on the front. Depending on the budget ODM can advise you the type of genuine leather or artificial leather which can suit your corporate style and promotional campaign in a best way. If you are interested, you can check our blog about different types of leather. Practical. Choosing a marketing gift for your next promotional campaign, make sure that the product is useful and handy. Branded leather wallet is a necessity item therefore it will be used daily and no doubts that it will increase brand recognition. Such items works as a long-term advertising for your company. Stylish. Elegant design attracts a lot of attention. It is perfect as a New Year gift or just corporate gift for your important clients, business partners and colleagues. They will appreciate a lot to receive a branded leather items. High perceived value. 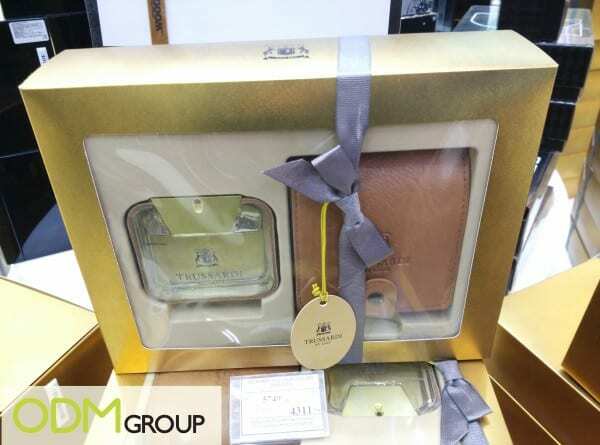 A set comes in a gift box with a window which makes a great combination along with the leather wallet and adds a great perceived value to your product. 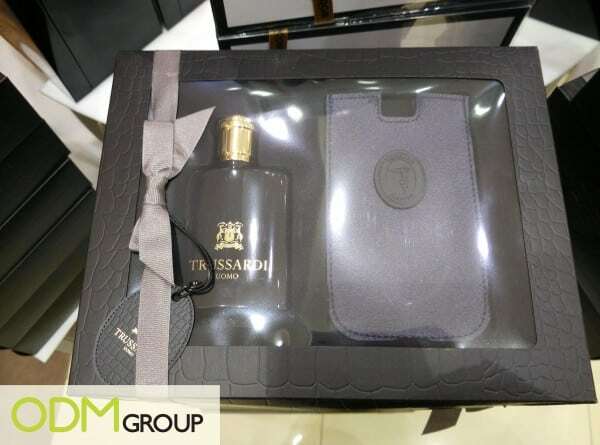 Second item that Trussardi is giving away is a branded leather phone case. It is made in a dark blue colour with sewed leather tag on the front side. The logo is embroidered on the tag to increase brand recognition. These gift sets are targeted for Men, as come with cologne. We think that Trussardi chose a good strategy offering branded leather wallet and phone case to this audience. Both gifts look elegant, stylish and premium. 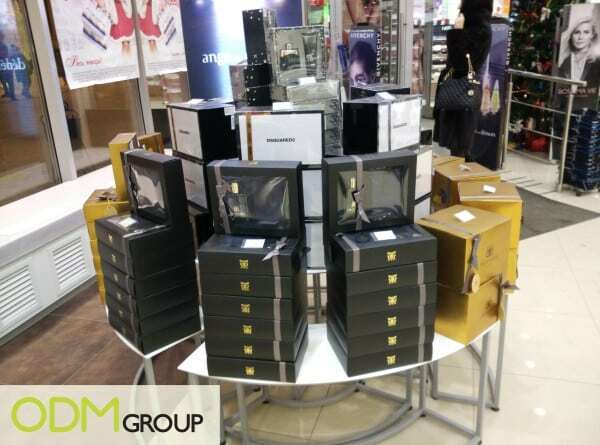 POS stand in a shop attracts a lot of consumer’s attention and the promo action can increase sales in a great way. Here at ODM we have years of experience in manufacturing promotional products. Feel free to contact us to learn more about how we can assist with some new and innovative ways to promote your brand.